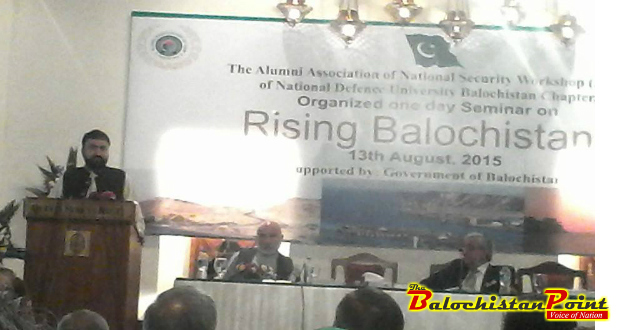 Quetta – Rising Balochistan seminar was held in Serena Hotel Quetta, on Thursday. Seminar was organized by the Balochistan chapter of Alumni Association of National Security Workshop (AAN) with the support of Balochistan government. Governor of Balochistan, Muhammad Khan Achakzai was the chief guest of the seminar and delivered the opening address about how Balochistan is developing and rising. Commander Southern Command, Lieutenant General Nasser Khan Janjua was also present on the occasion. Seminar was divided into three plenary sessions; first session was titled Geo-strategic Perspective, second session was titled Security and Governance in Balochistan and third session was titled Rising Balochistan – Pakistan’s new resolve. Sarfraz Bugti, provincial minister of Home and tribal affairs delivered a lengthy speech about law and order situation in Balochistan. Mr. Bugti discussed the efforts of incumbent Balochistan government in curbing organized, crime, sectarian attacks and insurgency. “Balochistan police has more sophisticated technology as compared to police forces of all other provinces,” claimed Mr. Bugti. Highlighting the support the military has provided to Balochistan government, Mr. Bugti revealed that Special Services Group (SSG) of Pakistan Army has trained Anti-Terrorist Force (ATF) of Balochistan Police and Levies force has been trained by Frontier Corps (FC). Briefing the participants about implementation of National Action Plan (NAP), provincial minister said that 4,069 people have been arrested in Balochistan as a part of NAP. He announced that Apex committees would be constituted at division and district levels to improve coordination between civil government and military and paramilitary forces. Nawab Ghous Baksh Barozai, caretaker Chief Minister of Balochistan in 2013, apprised the participants of the seminar about the governance related issues of the province. “I governed for 2 and half months without a cabinet because governance related problems would have compounded if I had a cabinet,” said Nawab Barozai. Chieftain of Barozai Clan corrected Sarfraz Bugti on the issue of who had facilitated purchase of advance tracking technology for Balochistan Police. “I paid for the purchase of tracking equipment from my secret funds and even acquired receipts for that,” added Mr. Barozai. Nawab Barozai further claimed that He handed over relatively much peaceful Balochistan to incumbent government as compared to what he had inherited at the start of his tenure. Jam Kamal, Minister of State for Petroleum and Natural resources also delivered a lengthy presentation about Balochistan. Jam Kamal stressed on the need to increase capacity of Balochistan government in all aspects so that it’s ready to absorb the potential benefits of China-Pakistan Economic Corridor (CPEC). Mr. Kamal said that access to justice should be the primary focus of the rising Balochistan as there can be no progress without justice in the society. Nawabzada Aminullah Raisani, former ambassador of Pakistan to Syria, Lebanon and Oman also addressed the seminar. He lamented that there is no trade between Iran and Pakistan at major scale just because Iran share borders with Balochistan. Dr. Shahid Masood, anchorperson and famous analyst, said that not only Baloch insurgent leaders but also the Baloch ministers in incumbent governments are living luxurious lives. Notable Journalists and columnists from Pakistan including Haroon Rashid, Wajahat S. Khan also participated in the seminar. Rising Balochistan seminar was concluded on the note that development of Balochistan is essential for prosperity of Pakistan.